Love your effects pedals? Then show them some love! The PB600 protects up to 6 of your favourite stomps, and keeps them ready to rock at a moment’s notice. 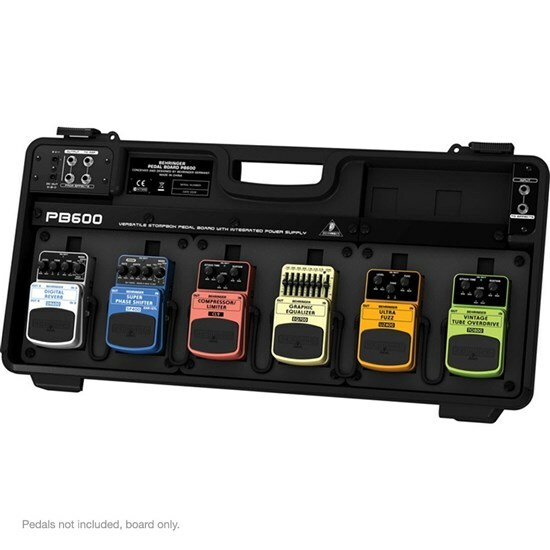 This rugged suitcase-style pedal board comes with everything you need, including an integrated power supply and enough audio and power cables to interconnect up to 6 devices. The removable cover can even be locked (locks not included) for a double layer of protection. 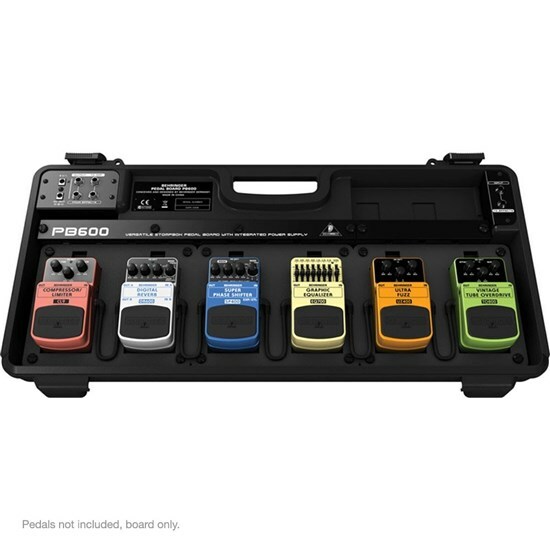 This pedal board makes hooking up six 2.5" x 4.5" pedals as easy as hooking up just one (of course, if you’re using pedals that aren’t 2.5" x 4.5", the snug foam padding can be cut to accommodate pedals of varying shapes). 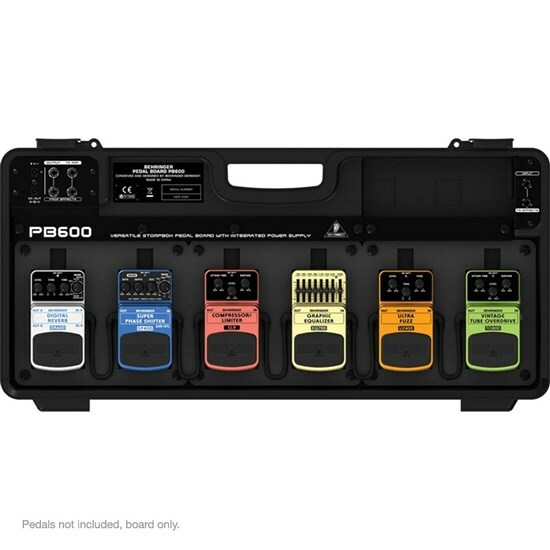 The PB600 includes ¼ " patch cables, so you can leave your pedals connected to one another, ready to pass signal even when you’re transporting them. It also comes with 1 x 6 daisy-chain cabling, so that when you plug in the 1.7 A power adapter, all your pedals receive power. Meanwhile, all cabling remains safe and free of strain. 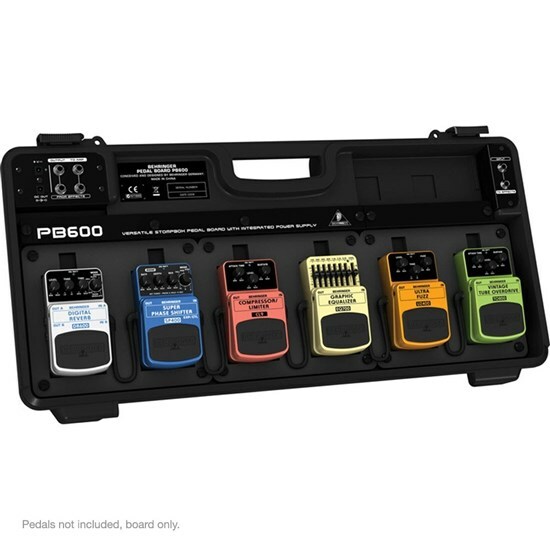 With the PB600 – your effects chain is always safe and organised. 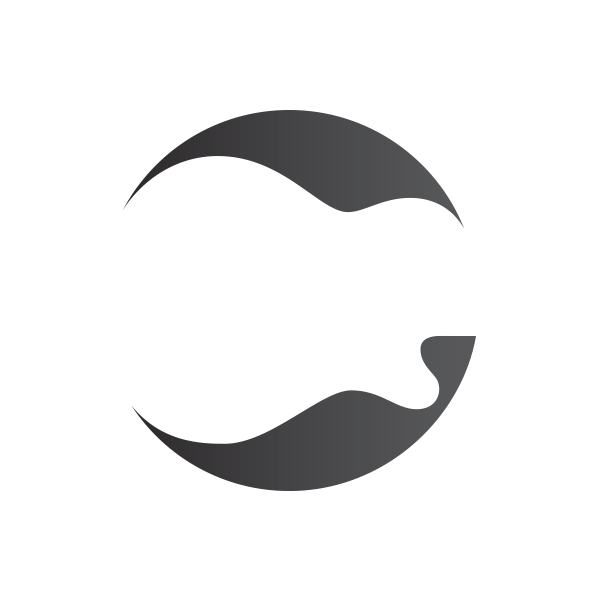 Connect your guitar, bass or keyboard to the single ¼ " input in the upper right corner of the board. A pair of ¼ " From Effects jacks in the upper left corner allow you to connect stereo effects, and two ¼ " Output To Amp jacks send a left and right stereo signal to up to two amps. When it is time to load out, just unplug the power supply, disconnect your guitar and amp, put the lid back on the PB600 and slide the locking latches back into place. The high-impact plastic casing will protect your pedals from the rigors of the road.